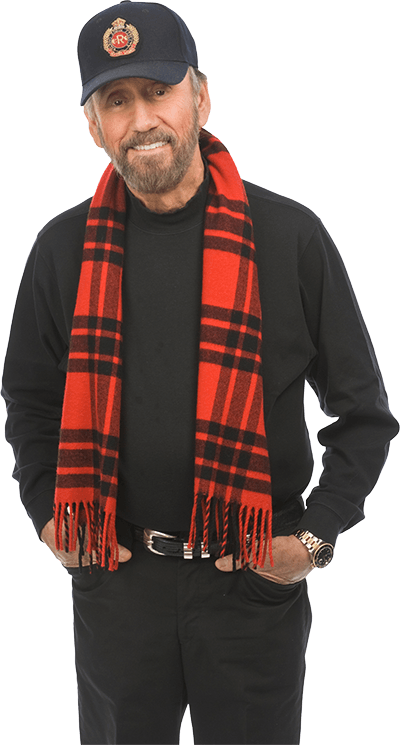 Country music funnyman Ray Stevens is returning to his classic roots with comedy music album, Here We Go Again. This is Stevens' first all-new comedy album in nearly a decade. The 12-track release is full of classic Ray Stevens-style tunes that are sure to tickle the funny bone. After taking a detour, of sorts, over the last 5+ years and releasing some hilarious political songs on a couple of CD's, plus issuing a 9-CD box set called "The Encyclopedia of Recorded Comedy Music" (containing his versions of novelty songs of the last 50+ years), a majestic gospel CD last year called "Gospel Collection, Volume One", and a memoir titled "Ray Stevens' Nashville"...after those projects, Ray Stevens returns to country comedy on his latest CD. The cover art, as you can see, takes place in an airport setting. In a touch of silliness, a gorilla plays the part of the chauffeur. On the back of the CD the songs are listed as if they're flights posted on the Arrival board. The CD's first single release arrived in music video form a month ago...titled "Taylor Swift is Stalkin' Me" it's a story of a man that's obsessed ith the belief that he's being stalked by the pop-country singer because, according to him, he sees her everywhere and given that her likeness appears everywhere he happens to be he thinks she's stalking him. The song has a comical twist ending, though. Throughout the song he insists that Taylor's up in a tree looking at him with binoculars. After the bouncy opening track about Taylor we're treated to Ray covering one of his musical idols, Ray Charles. I pretty much know that the purists that'll hear the Ray Stevens rendition of the Ray Charles classic "What'd I Say" aren't gong to like it. After all, they may ask, how can you top a Ray Charles recording? I don't necessarily believe Ray Stevens set out to try and top the classic rendition from Ray Charles, though. I think that Ray Stevens simply wanted to record the song and so he did. I happen to love the rendition. Even if some may groan about the idea of someone other than the late Ray Charles performing that song at least it gives Ray Stevens an opportunity to display his obvious love for classic Rhythm and Blues music. Aside from the song about Taylor Swift, one of my other favorites from this CD is "There Must Be a Pill For This". This one is vintage Ray Stevens...it tells the story of pills...and the enormous quantity of pills that are on the market for everything under the sun. Pills to help thick people lose weight, and pills to help frail people gain weight. It's a satire on pills...miracle pills, specifically...and as an added pleasure there's a parody of those lengthy disclaimers that appear as voice-overs on healthcare commercials. The tempo changes for the next song, "Walkin' the Dog". In this one Ray sings of constantly bickering with his wife. Instead of moping around the house he simply goes outside, gets Rover, and walks the dog. He reckons that once he starts to take the dog for a walk he may run into a woman putting on the dog (presumably to be a possible new love interest). Track Five is thrilling...a cover of "Hearts Made of Stone". I looked up the song's title and found out that it had been a Rhythm and Blues hit in 1954 for a group called The Charms. I had heard an audio clip of Ray's recording and since that time I had been wondering the reason for the 1950's-style of audio (complete with echo!) and I eventually found out the reason. It's clearly the stand-out song on the CD if only for it not vocally sounding like anything else. I love the over-dubbed do-wah harmonies heard throughout. The most country sounding recording on the entire CD is "Pickin' on the Chicken". This one, too, is one of my favorites. In the song Ray sings from a chicken's point of view and he demands to know the reason so many negative expressions are associated with chickens, hens, and eggs. Throughout the song we're treated to a list of expressions and sayings that put the chicken in a bad light...expressions like 'madder than a wet hen'; 'that's chicken feed'; 'He's got egg on his face'; 'One flew the coop'; etc. Ray also manages to get in a reference to Willie Nelson, too, in a laugh out loud funny one-liner. The second-most country sounding recording is "The Baptism of Stumpy Brown". The song is about an atheist that suddenly finds religion in his 90s and insists on being baptized as a result. The frail body in a raging river is bound to cause some incidents...and Ray tells of those in this story. Inspiration surfaces in the song "Little by Little". There is a song on here called "You Didn't Build That"...let's just say I find it hilarious...but it's something that more than likely is not going to go over too well with, say, fans of the President. That song is followed by a contemporary classic in the form of the illegal immigration anthem "Come to the U.S.A." (a song from 2010). Illegal immigration is a hot topic and one that's consistently controversial. Although I'm reviewing the CD there's an Mp3 copy for sale, too, and that means customers can pick and choose the songs they want to purchase from HERE WE GO AGAIN! I prefer having a physical copy of the CD. Along the lines of manhood and masculinity comes "A Handshake Will Do", track 11. The lyrics cry foul on guys hugging other guys unless it's called for and Ray gives examples for when it's okay. Ironically, on the day this CD went on sale, a picture of Larry Gatlin attempting to hug Ray appeared on Ray's social media sites. There's no reference to this song as far as the picture is concerned, though. I call it just one of those ironic coincidences. Ray had appeared as a guest artist on the Grand Ole Opry on March 21st on a segment hosted by Larry Gatlin. The CD's closing track, "Knock Him Out John", is another one of my favorites. I call it a tribute to the late Jerry Clower. It's a recap of Jerry's story of the time he and some of his friends went hunting for raccoons and ended up having an encounter with a lynx. Ray's recording is the story set to music. Ray does his rendition of Jerry's holler and it appears at various moments during the song's chorus. I thoroughly enjoyed the CD...his restless energy and incredible vocals are on full display on this CD! You Go Ray! YOU ROCK!! Ray, once again - You've done it!! Fantastic! Sing-able! Hilarious! Family Fun! !